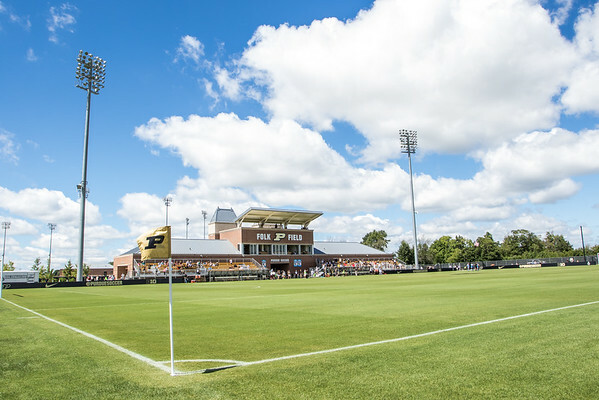 This past summer the Purdue Soccer Complex finally received a name. It is now named Folk Field after Loren and Donna Folk. I like the idea of the field finally having a name. It gives it a bit of personality that it seemed to be lacking just being called the Purdue Soccer Complex. Part of my goal Sunday was to capture a few images with the new name in the background. A lot of things were in my favor doing it Sunday as it was a Chamber of Commerce day. The conditions were perfect to make a photo of the stadium. The stadium looked great to start the season as well. The grounds crew does a great job with all of the stadiums making Purdue a beautiful place to play sports. Maybe they can come and help me with my lawn. I would kill for a small patch of grass that looks like the entire field does here. As I said yesterday I really enjoyed last week. I was able to get out and photograph some sports that I have not photographed in quite a while. You can see my favorite photos from the past week here. These first few weeks of the school year usually are very exciting as I can get back out and photograph something other than baseball. I love football, and I was able to photograph that on Friday night. The best part about that was that the home team won big. I also was able to photograph some soccer and volleyball. Over the next couple of weeks that will be all that I shoot so it was good to get out and stretch my legs so to speak with all three sports. I won’t shoot football again until the second week in September, but that is a big job that I wanted to have some experience under my belt this year for. After this weekend I should be well back into the groove photographing volleyball. I have four matches scheduled to shoot for sure with a few around those that I can photograph as well. This is a fun time to photograph, and the weekly look back at my photos should show that over the next few weeks.